Cox’s Bazar - Heavy rainfall in Cox’s Bazar earlier this month has put major strain on drainage systems in Bangladesh’s Rohingya refugee camps, according to IOM engineers, who predict it will cost at least USD 1 million to clear blocked channels and maintain them to prevent dangerous flooding in future. Almost a million Rohingya refugees, who fled violence in Myanmar, are living under tarpaulins on Cox’s Bazar’s crowded, bare, sandy hillsides in what has become the world’s largest refugee camp. Efficient canals and drainage systems are crucial to prevent flooding and the build-up of stagnant water, both of which can lead to dangerous and life-threatening contamination of clean water supplies and create environments in which deadly diseases can thrive. Despite intense efforts by IOM and other agencies, who have been working with the government of Bangladesh to install crucial drainage infrastructure to ready the camps for the cyclone and monsoon season, unusually heavy rainfall in the first half of June filled many canals and drains with sediment, dangerously restricting water flow. Roads, shelters and services were also affected by the downpours and IOM staff have been working round the clock to assess and repair damage. But according to IOM’s Emergency Coordinator in Cox’s Bazar, Manuel Pereira, the impact on the canals and drainage system is of particular concern. “The extremely heavy rains pushed down large amounts of silt and soil from the hillsides into the canals and drains. There are now areas where water can no longer flow through them,” he said. “It is imperative that we get these cleared as soon as possible. We will also need funding to keep clearing them through the monsoon months ahead. Preventing the spread of large amounts of contaminated water through the camps is a matter of life and death,” he added. But Pereira warned that with the overall Rohingya refugee response in Cox’s Bazar still less than one quarter funded, almost all agencies are struggling to continue to provide vital services, including drainage, clean water and sanitation. IOM’s own funding appeal for USD 182 million has secured just 22 per cent of that amount. 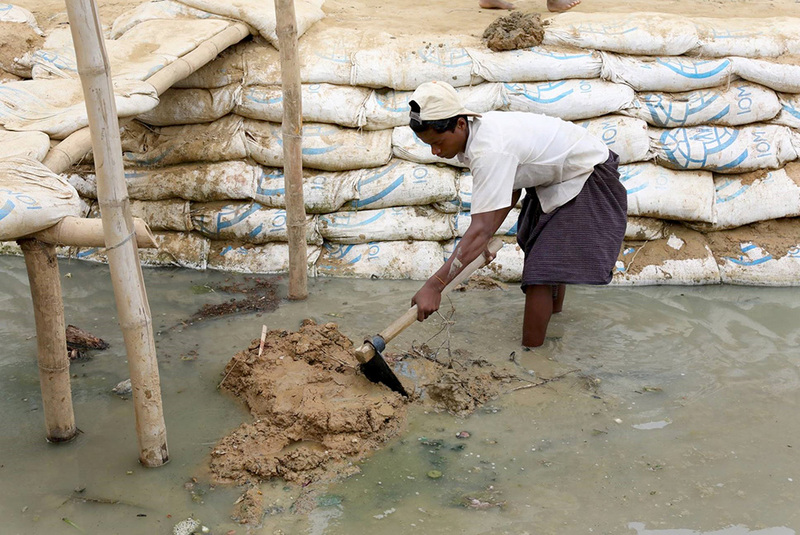 Since February, IOM engineers working with Rohingya refugees have already constructed over 20km of major drainage channels throughout the Kutupalong mega camp and an additional 10km in communities further south. According to Damon Elsworth, operations manager of the Site Maintenance and Engineering Project (SMEP), the basic canals and drain structures stood up well to this month’s downpours and none had burst. But the rapid buildup of sediment highlights the major challenges ahead. “Canals and drains need dredging regularly. But the rainfall has discharged higher volumes of sand and clay than anticipated. It is now evident that the task of operation and maintenance of these waterways will be more intense than previously thought. We are still early in the monsoon season where the full impact of sediment accumulation is yet to be seen,” he said. Under the SMEP, an IOM joint project with WFP and UNHCR, there are 14 infrastructure response teams stationed across Cox’s Bazar ready to deploy for urgent road repairs and drain clearance throughout the monsoon period. They comprise 170 workers equipped with machines, pumps, hand tools and lighting towers for 24-hour working. But according to Elsworth, analysis of the impact of the recent rains indicates a need for more teams to ensure that the work is carried out as quickly and safely as possible. This would inevitably require more funding. Across the camps, IOM and its partners are continuing to work round the clock to support the refugee population as the monsoon begins. Site development and site management teams are continuing to work with refugee households at most risk of flooding and landslides. Health teams are working to ensure continued service in key sites with mobile medical teams on standby. Water, Sanitation and Hygiene (WASH) teams are working to ensure adequate access to functioning latrines and protection teams are continuing to engage with the refugees across all sectors.